2018 Pride weekend is just around the corner! Will you be marching with U of T in the Trans March, Dyke March or Pride Parade this year? 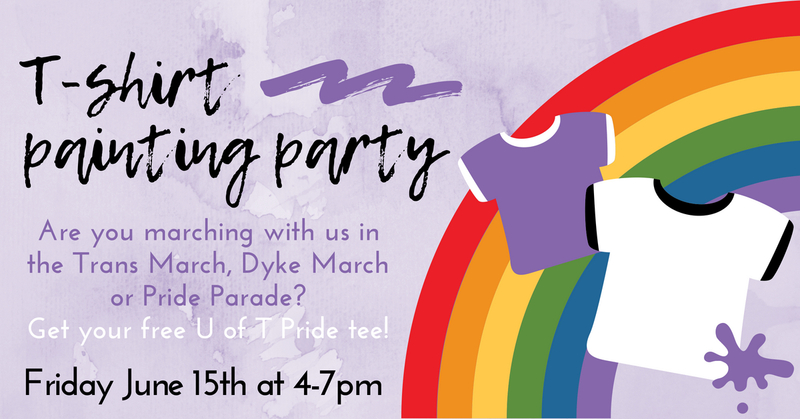 If so – we have amazing free U of T Pride t-shirts for you to paint, cut, glitter and make all on your own! Join us on Friday, June 15th from 4:00 – 7:00 pm. Pick up your U of T Pride t-shirt and get it ready for the streets this Pride. We will have markers, paints, scissors, beads, and other supplies for you to personalize your shirt just in time for Pride weekend. Don’t know how to make your own shirts? – we have videos prepared to show you some designs that you will love! Students, staff, faculty and alumni are welcome to join us. Snacks will be provided. There are a limited amount of shirts available, so we ask that only those who will be joining us for the parades and marches pick up a shirt. We will have the shirts in S, M, L, XL, XXL and XXXL. Limited shirts are available, so we ask that only those who will be joining us for the parades and marches pick up a shirt. If you are unable to attend these events, you can email sgdo@utoronto.ca to arrange for a time to pick up your shirt. We will also be bringing all leftover t-shirts to the Pride Parade (June 24). If you have any accessible needs, please contact the office at sgdo@utoronto.ca.